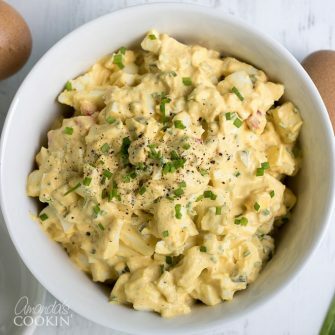 Growing up we always had Ambrosia Salad on the holiday table. 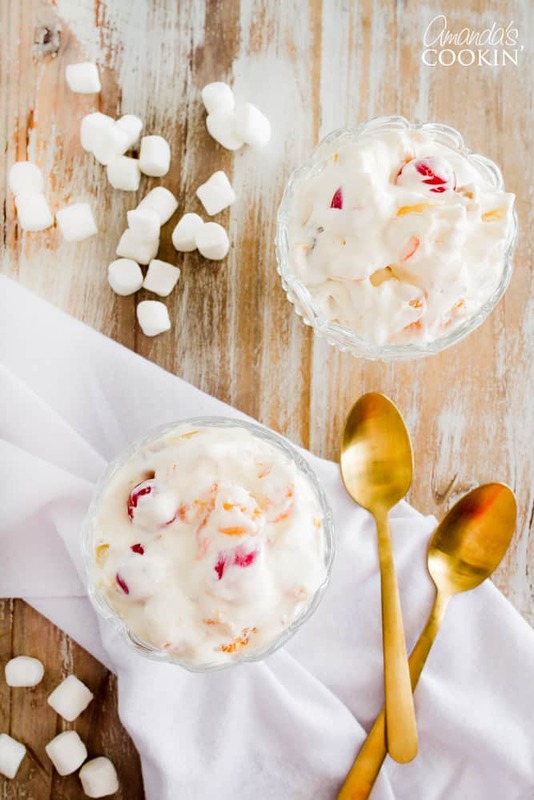 Potlucks, barbecues, family get-togethers, ambrosia salad is just one of those desserts that everyone likes and someone always brings! Another one we love from grandma’s holiday table is this Watergate Salad! Such a mainstay. There are different versions, some with sour cream, some without, some with cream cheese, and so on. As long as there are lots of maraschino cherries, I’m there. This popular no-bake dessert is a quick and easy bring along that you can whip up in a short amount of time. 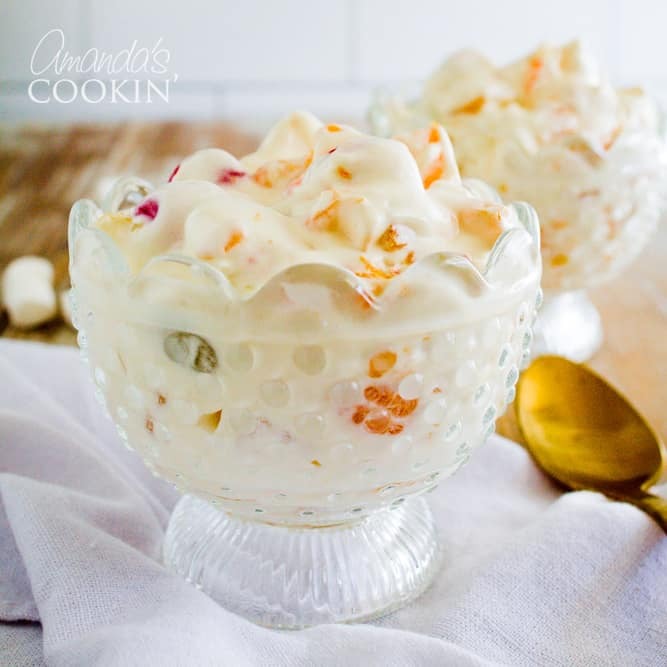 If you’re looking for an easy yet extremely satisfying dessert that everyone is bound to enjoy, then this Ambrosia Salad is the one for you! Packed with mandarin oranges, pineapple tidbits, fruit cocktail, marshmallow, maraschino cherries, and a simple Jell-O pudding this dessert has all the flavorful punches you’re craving! Pretty dessert dishes aren’t a deal breaker, but they’re so fun and look so nice on the table! Simple bowls or cups from your cabinet will work just fine. We often use paper or plastic bowls for parties! Every cook, amateur and experienced alike should have a set of measuring cups. They are absolutely essential in cooking and baking and are inexpensive. Something I’ve learned is that you need a separate set of mixing bowls aside from the bowls you use to serve. When you only have a couple in the cabinet you’ll be constantly washing dishes so you can use it to serve in. Make sure you drain all the fruit. If your fruit was packed in syrup, definitely rinse it in cold water and drain again. First combine the fruit cocktail, pineapple, mandarin oranges and cherries in a large bowl. Sprinkle the fruit with cheesecake flavored pudding mix and stir to coat everything. Next add in the sour cream and the Cool Whip and stir well. Fold in the miniature marshmallows and chill in the refrigerator for at least one hour before serving. Fruit – Instead of using canned fruit cocktail, you can use all fresh fruit of you prefer. Fruit cocktail usually includes peaches, pears, grapes, pineapple, and cherries. The benefit of canned fruit is that it’s soft and you don’t have to worry about making sure the fruit you purchase is perfectly ripened. Ambrosia is usually made up of fruit cocktail, pineapple (fresh or canned), mandarin oranges or fresh orange segments, flaked coconut and quite often maraschino cherries as well. I’ve also heard of mixing in strawberries, grapes, bananas and blueberries. 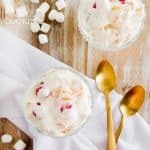 Topping – While we use powdered pudding mix, Cool Whip and sour cream, there are variations of ambrosia salad that use cottage cheese, cream cheese, yogurt and even mayonnaise. You can also substitute the Cool Whip with fresh whipped cream. Why is it called Ambrosia? We’re not entirely sure, but we are guessing it’s a play off of the term used in Greek mythology that describes “food of the Gods”. Apparently, someone in the late 19th century, when Ambrosia Salad originated, felt it was worthy of the title! Growing up we always had Ambrosia Salad or Watergate Salad on the holiday table. 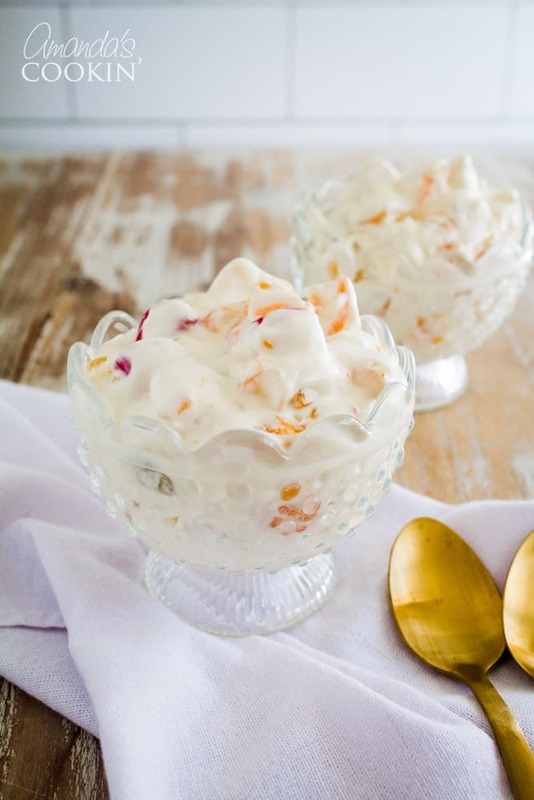 Potlucks, barbecues, family get-togethers, ambrosia salad is just one of those desserts that everyone likes and someone always brings! Drain all fruit. If fruit was packed in syrup, rinse in cold water and drain. Combine fruit cocktail, pineapple, mandarin oranges and cherries in a large bowl. Sprinkle with cheesecake flavored pudding mix and stir to coat. Add in sour cream and Cool Whip and stir well. Fold in marshmallows and chill for at least one hour before serving. This post was originally published on this blog on May 25, 2014. I just got done making this dish and it tastes and smells so delicious. Oh I love this! Hope you enjoy it! It says sour cream? Is it suppose to be cream cheese?? I know sounds odd to some people! it is sour cream. I use sour cream not pudding in mine. The coloured marshmallows sweeten it up overnight. YESSSSS….Ms. Amanda!!!! I found the ‘close’ you pointed out, but I never would have seen it without your prompting. THANK YOU SO MUCH, DEAR! I will look into gathering the ingredients as I can, and making it. What a treat this will be! I find it unpleasant to be promised ‘your’ recipe, but then have to enroll/sign up to another site. May I ask the reasoning behind this inconvenience, please. I’m very disappointed to find this wall between me and your site. I, too, grew up with this vintage delight, but my mom didn’t work from recipes, so I have no clue what she put in it. I’m so disappointed. Hello Ja Jones. I apologize that you felt you had a less than pleasant experience on my blog. I would be happy to explain to you the reason why this post is formatted in this particular way. When I made and photographed this recipe, I made it for another website. They hired me to make it and in my contracted agreement I was to keep the recipe exclusive to their site. That meant that if I wanted to tell my readers about it, I would need to “tell them” but was unable to provide the recipe here. Instead I was required to send visitors to the other site where the recipe lives. As for the other site, they do have a pop up that asks you to sign up for their free newsletter. However, signing up is NOT a requirement in order to access the recipe. There is a “close” link in the corner of the box. So when that subscribe box appears, simply click “close” and you will be able to access the recipe. I hope this helps clear things up. 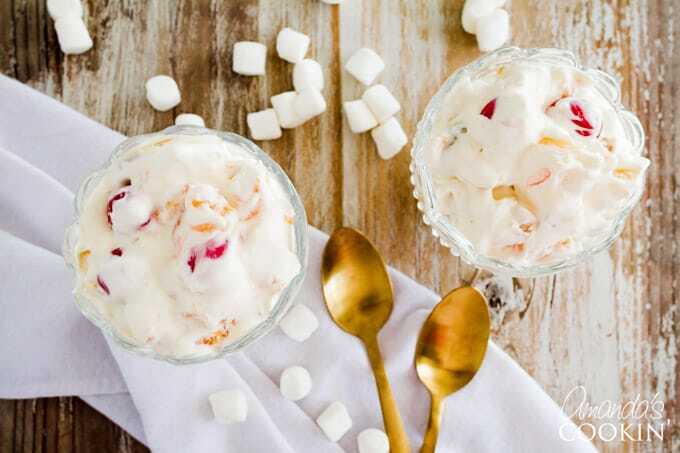 I would like recipe of Ambrosia Salad. Hi Louise. There’s a link in the post that will take you to the recipe!